In Michael Robotham's latest thriller, psychologist Joe O'Loughlin--the appealing hero of Suspect--tries to prevent a suicide and finds himself locked in a deadly duel with a very clever killer. Joe O'Loughlin is on familiar territory--standing on a bridge high above a flooded gorge, trying to stop a distraught woman from jumping. She is naked, wearing only high-heel shoes, sobbing into a cell phone. Suddenly, she turns to him and whispers, You don't understand, and lets go. Joe is shattered by the suicide and haunted by his failure to save the woman, until her teenage daughter finds him and reveals that her mother would never have committed suicide--not like that. She was terrified of heights. Compelled to investigate, Joe is soon obsessed with discovering who was on the other end of the phone. What could have driven her to commit such a desperate act? Whose voice? What evil? Having devoted his career to repairing damaged minds, Joe must now confront an adversary who tears them apart: a man who searches for the cracks in a person's psyche and claws his fingers inside, destroying what makes them whole. 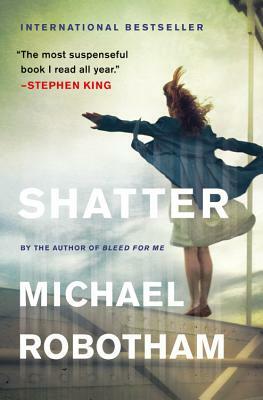 With pitch-perfect dialogue, believable characters, and intriguingly unpredictable plot twists, Shatter is guaranteed to keep even the most avid thriller readers riveted long into the night.